From the extended family of the superb Polish Precedent and by the unbeaten Winner of the 2000 Guineas and now highly successful sire, Footstepsinthesand, Mark bought this rangy yearling filly at the October Tattersalls Yearling Sale. Her dam, E175k yearling, was unraced but has produced three individual winners from three runners and the second Dam, Crafty Example, is the Dam of the 1998 European Champion Older Horse and Queen Anne Stakes winner and now successful Sire, Intikhab, as well as eight other individual winners. If you follow this link you will be able to see something of Intikhab's career. If you go here you can see her at the beginning of November taking the next steps in her career (and a happy acceptance of tack and girth!!) and showing off her fluid movement; moving on a week or so and here she is showing off her contented temperament and elegant action under Ellie's highly competent long rein; and the training resulted in her being contentedly being ridden away on the 1st of December as shown below! Progressing to the first week of January here she is breezing behind the Havana Gold Two Year Old Filly; and three weeks later here she is being led by Misu Pete and in behind the Havana Gold filly; and on the 14th February she is showing some further progression working in behind Mistry. On the 28th of February she is working at half speed at a weight for age difference in the saddle of circa 30lbs in behind Arlecchino's Arc. And here she is being led by the multiple winner Misu Pete on 18th May 2018. Here she is working over seven furlongs with Arlecchino's Arc on the 6th of July 2018. A month later and around 30lbs wrong she is working upsides Rocus. 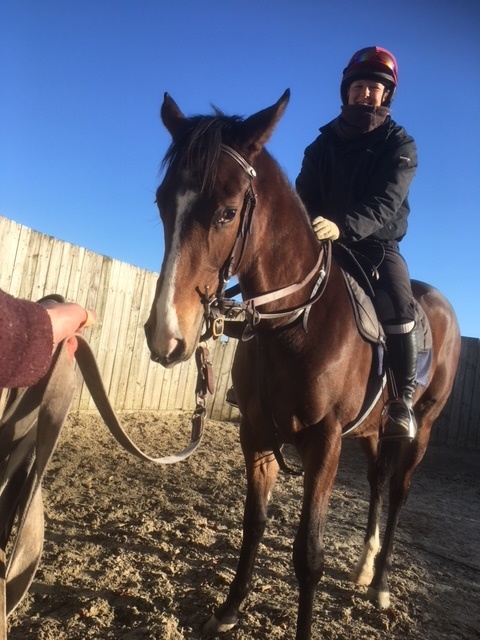 She is entered in the £150k Tattersalls October Sales race run at Newmarket this Autumn and Mark is looking to put her on the track at Wolverhampton on the 5th of September 2018 in a seven furlong Fillies Maiden; and here she is working with Black Truffle around 24lbs wrong on the 23rd of August.